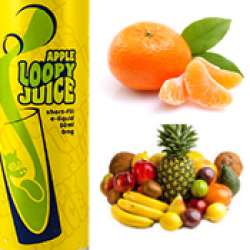 Loopy Juice are insanely good fruit flavours designed to blow your mind. Ratio: 80 / 20 VG. Apple Loopy Juice Insane intense Apple flavour bursting out of this amazing juice. Exceptional va..
Orange Loopy Juice Insane intense Orange flavour bursting out of this amazing juice. Exceptional .. Tropical Loopy Juice Insane intense Tropical flavour bursting out of this amazing juice. Exceptio..
Grape Loopy Juice E Liquid Insane intense Grape flavour bursting out of this amazing juice. Just ..